I thought you would be interested in the Akita prophecies on end times. These prophecies were first approved by the local Bishop of Niigata, John Shojiro Ito, as well as by Rome, via then Joseph Cardinal Ratzinger, now Pope Benedict XVI. Later, they were silenced, due in no doubt to the many references to corruption in the clergy, all the way to the top. This statue wept 101 times over a course of several years, from January 4, 1975, to September 15, 1981, the Feast of Our Lady of Seven Sorrows. It also perspired abundantly, and the perspiration sent out a sweet perfume. Its right palm bled from a wound that had the form of a cross. Hundreds of people witnessed many of these events. 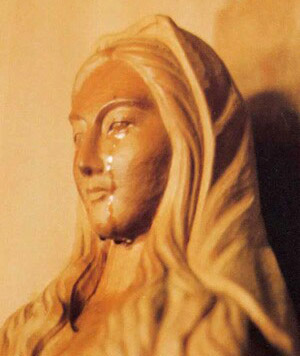 Scientific analysis of blood and tears from the statue, provided by Prof. Sagisaka of the faculty of Legal Medicine of the University of Akita, confirmed that the blood, tears, and perspiration were real human tears, sweat, and blood. Our Lady gave three messages to the world through Sister Agnes in the year 1973, all short, concise and maternal. On July 6, 1973, in the First Message, Our Lady told Sister Agnes her deafness would be cured (which it was in 1982), and told her to pray very much for the Pope, the bishops and the priests. “Many men in this world afflict the Lord. I desire souls to console Him to soften the anger of the Heavenly Father. I desire, with My Son, souls who will repair, by their suffering and their poverty, for the sinners and ingrates. “The work of the devil will infiltrate even into the Church in such a way that one will see Cardinals opposing Cardinals, Bishops against other Bishops. The priests who venerate Me will be scorned and opposed by their confreres. Churches and altars will be sacked. The Church will be filled with those who accept compromises, and the devil will induce many priests and consecrated souls to leave the service of the Lord. “The devil will be especially implacable against the souls consecrated to God. The thought of the loss of so many souls is the cause of My sadness. If sins increase in number and gravity, there will no longer be pardon for them. These prophecies, as far as I can see, are in perfect agreement with those of Fatima and Quito. I believe these warnings are quite timely, especially in view of the accelerated pace of revolution inside the Church. It is something for Catholics to consider as we view the revolutionary act of ‘retiring’ from the Papacy, like it was any other office or job, and the approaching conclave. Please keep up your good work and position of no compromise. It is interesting Our Lady of Akita says the Church will be filled with those who accept compromises. 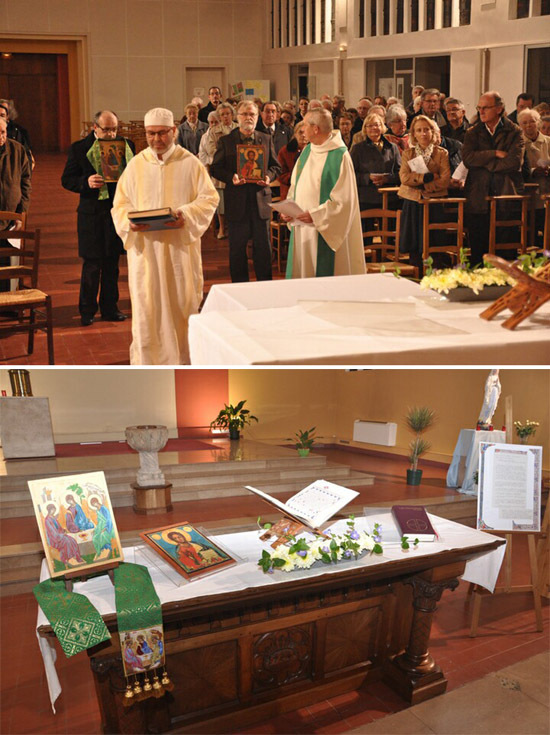 In Arras, France, the Koran was placed on the altar of Holy Savior Church (October 2011) as you can see. In the first photo below the Iman brings the Koran to the Altar; in the second photo it is placed opened on the center of the altar. More details, photos and the news report in French here. Thanks for the hard work in writing the latest in the Eli,Eli, Lamma Sabacthani? series, "The Destruction of God." I got my copy and it really helped to make my day. Especially, I like the excellent understanding Mr. Guimaraes has of philosophy; it was bad philosophy, applied to theology, and biblical exegesis that made the Modernists in Pope Pius X's day and ours the worst scourge the Church has ever known. I'll have to wait, though it won't be easy, with patience for the next volume in the most definitive account of what did and what did not go on at Vatican Council ll. A tragedy, the worst of many in the history of Roman Catholic Church. I agree totally with TIA that it is a waste of time to micro-manage the documents of Vatican II to save what can be saved. Vatican II must be declared null and void and struck from the books once and for all. Everything is fun and games and good times INSIDE the Church and DURING Lent. It is a sign of the times. Love your site and visit it every evening!